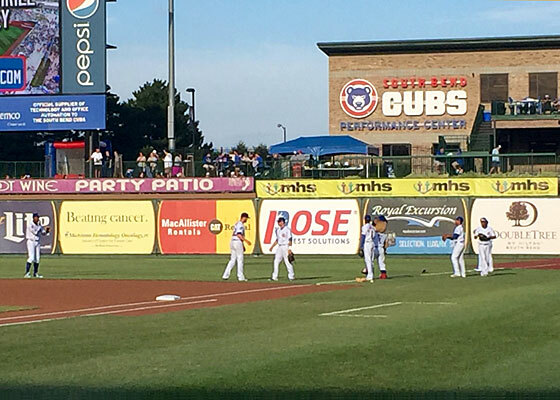 When I set out to sing the National Anthem at all of the ballparks in the Chicago Cubs organization, I never thought I would travel to Indiana. 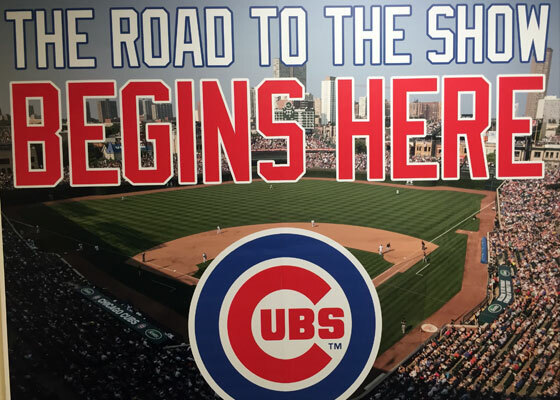 I also didn’t think I would have to “redo” two of the Anthems at new ballparks. 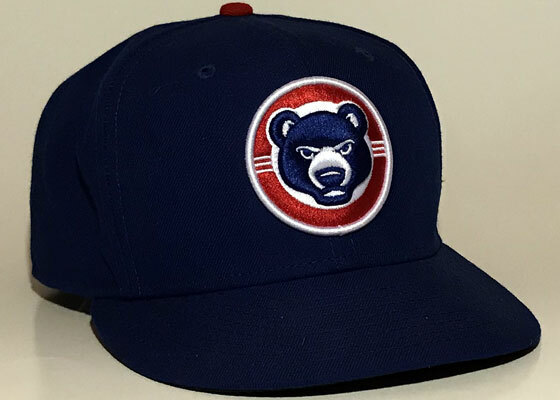 In the winter of 2014, the Chicago Cubs announced that they were moving three of their minor league affiliates: The Class A-Advanced affiliate would change from the Daytona (Fla.) Cubs to the Myrtle Beach (S.C.) Pelicans. 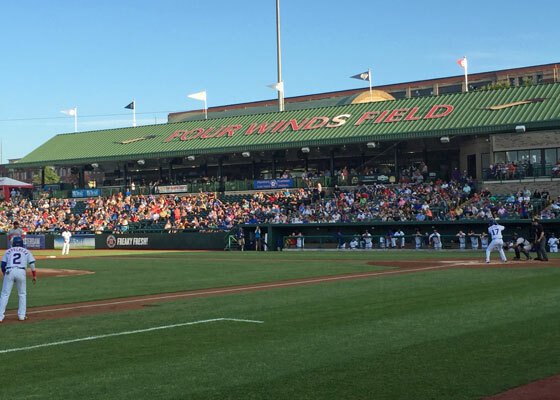 The Class A affiliate would move from the Kane County Cougars (Ill.) to the South Bend (Ind.) 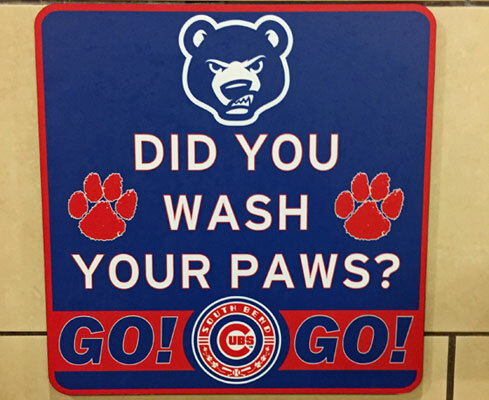 Cubs. 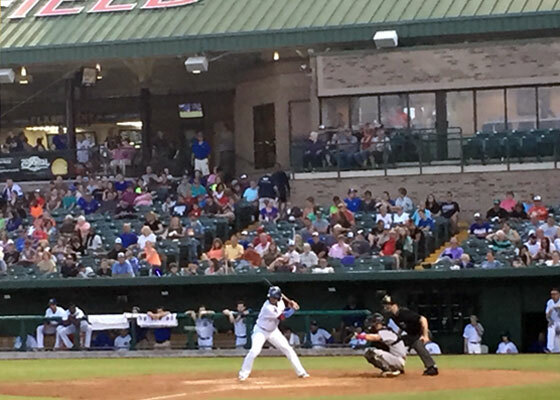 Finally, Class A – Short Season team would move from the Boise (Idaho) Hawks to the Eugene (Ore.) Emeralds. 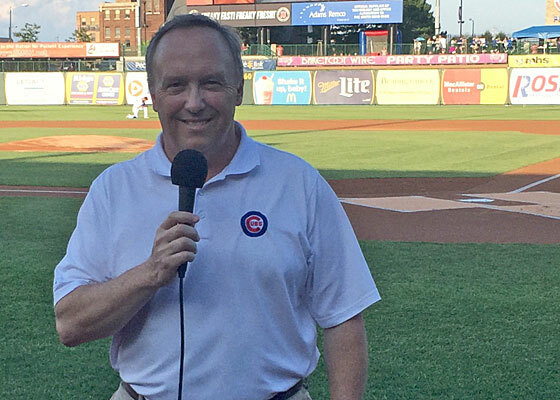 Since my goal was to reach a point in time when I had sung the Anthem at all the current Cubs ballparks, this move meant I would have to schedule performances at Myrtle Beach and Eugene. 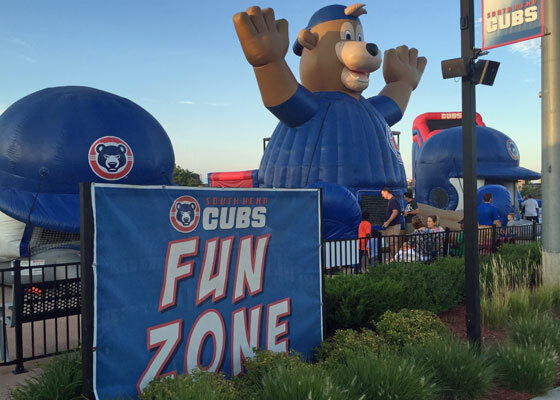 But since I had not yet sung for the Kane County Cougars, the only change was contacting the new management in South Bend. Ahh, South Bend, home of my alma mater, the University of Notre Dame. The campus is one of my favorite places on this planet, so any opportunity to visit the area is always welcomed. This trip would turn out to be a “Planes, Trains, and Automobile Trip.” To get to my accommodations at the Sacred Heart Parish Center on the ND campus, I first took a Southwest Airlines flight from Nashville to Chicago Midway. Then I hopped onto the train at Midway and took it to Millennium Station in downtown Chicago. 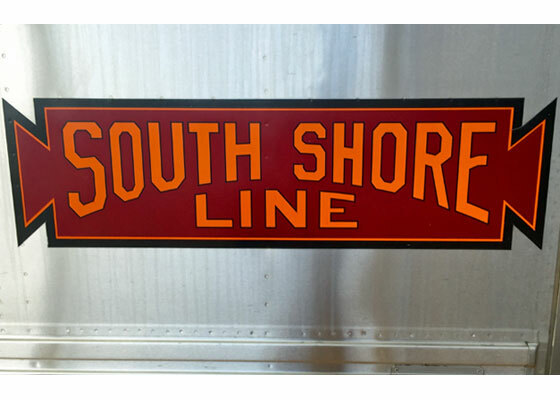 There I boarded the South Shore Line to South Bend, whose station was located at the airport. Once I arrived there, I took an Uber ride to the campus. 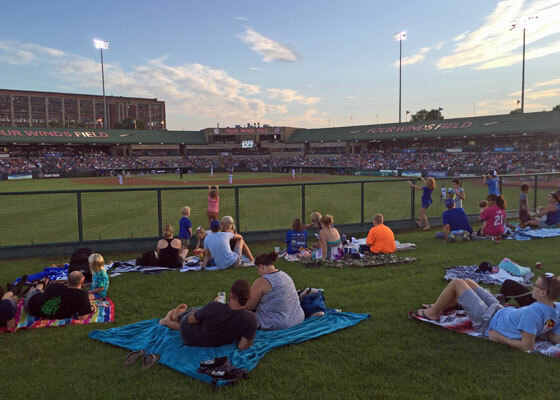 Once I was confirmed to sing for the South Bend Cubs, I checked with the University to see if there was a Notre Dame sporting event the same weekend that I would sing for the South Bend Cubs. As it turned out, the Notre Dame Women’s Volleyball team was hosting a tournament of college volleyball teams. 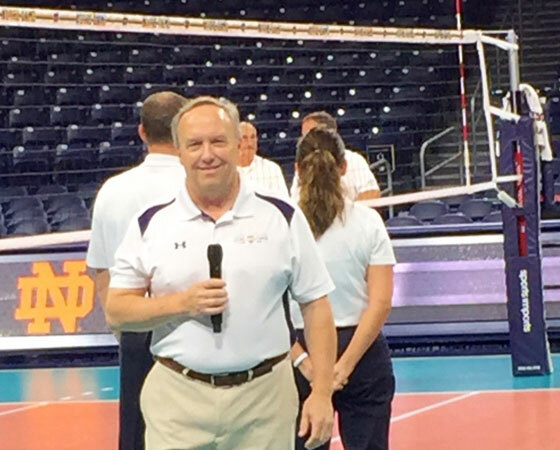 Since they needed a singer for the opening session Saturday morning, I was happy to sing again on the famed basketball court in the Joyce Athletic and Convocation Center (during my school years at Notre Dame in the late 1970s, I sang on the court as a member of the ND Glee Club. We sang a medley of Beach Boys songs during halftime, before finishing the set with the Notre Dame Victory March!). My nephew Kieran, a sophomore at ND at the time, came over to the match along with his friends. 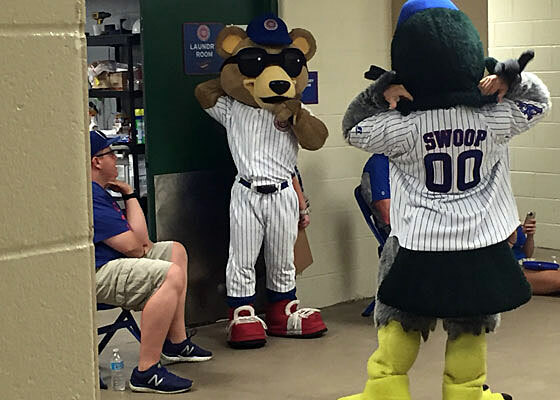 They would later join me at the Cubs game. My Anthem for the Irish went well. In fact, I was invited to stay around and sing the Anthem for the women’s lacrosse game Sunday evening. However, I couldn’t change my travel arrangements, so I’ll have to sing another time. 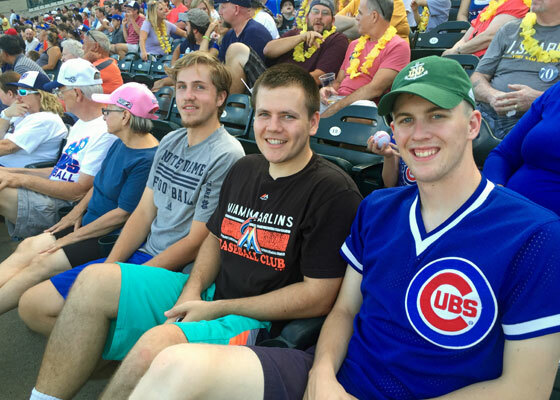 Kieran and his friends picked me up that afternoon to go to the Cubs game. 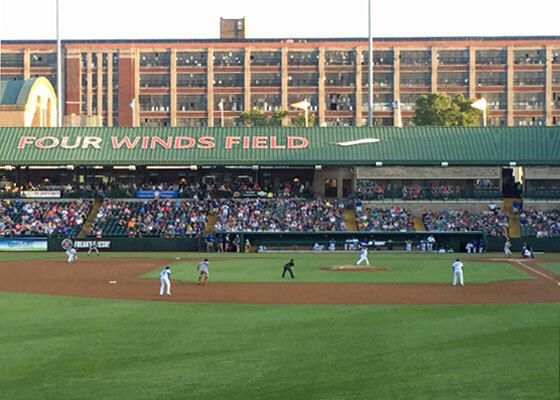 The game was held at Four Winds Field, the renovated home of the South Bend Cubs. 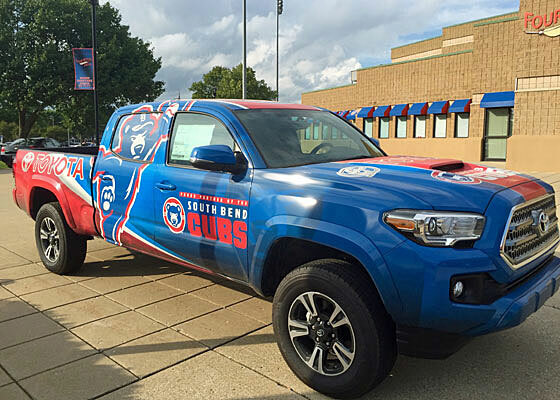 The team used to be known as the Silver Hawks, an homage to the Studebaker Silver Hawk automobile, which used to be manufactured in South Bend. 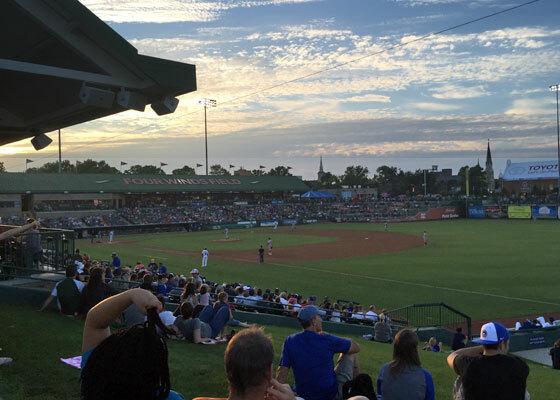 The ballpark had enjoyed a renovation in the last few years under the new ownership of Andrew T. Berlin, Chairman and CEO of Chicago-based Berlin Packaging. 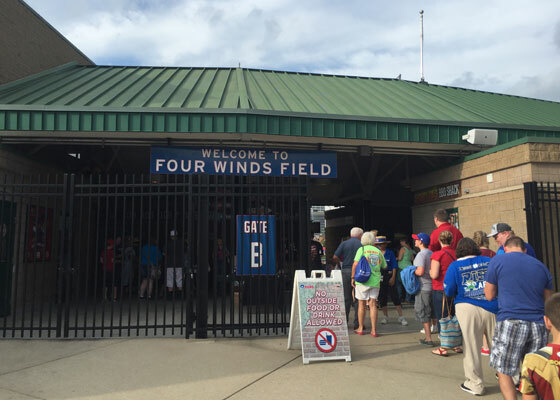 A new training facility was built behind the right field wall and was open to the public. 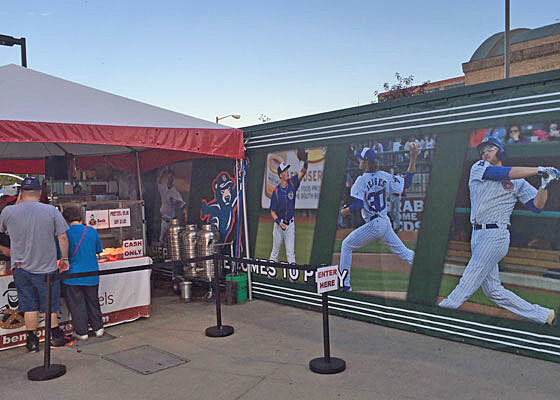 The new gift shop was created within the walls of an old Jewish temple located right behind the left field wall. After taking a few photographs outside the stadium, Kieran and I went inside. 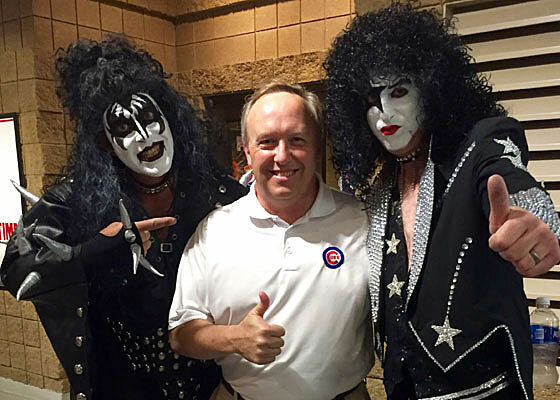 While waiting to meet up with the Cubs’ staff member, I met two gentlemen who were promoting an upcoming concert by a KISS tribute band. I just had to take my photograph with two rockers! Kieran was my designated videographer, so he and I went downstairs to hang around until it was time to go onto the field. There we met the president of the team and saw a few of the players getting ready. Finally, it was time to go onto the field and sing the Anthem. I was very relaxed on the field, as it really helped my nerves and my confidence that I had successfully sung the Anthem earlier that day at Notre Dame. I still went through my regular pre-game routine of softly singing the lyrics over and over again, just to keep them at the top of my consciousness. My performance of the Anthem went well; I even held out the phrase “’oer the land of the free” just a little longer than usual. 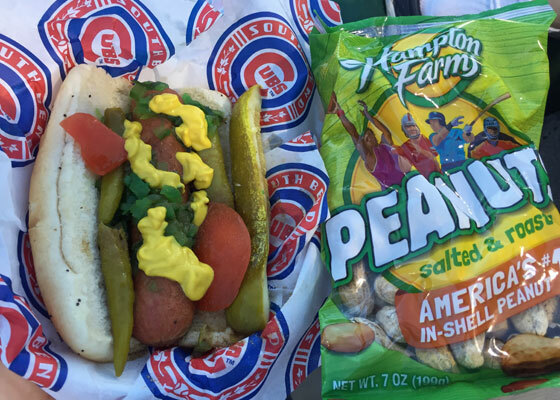 Afterwards, I headed back into the stands to get my customary hot dog from the concessions stand. 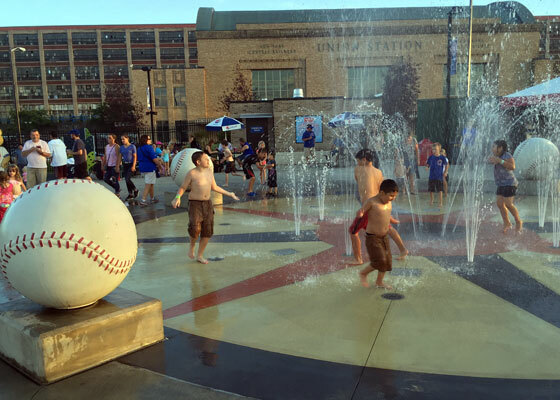 I also took some time to walk around the ballpark and take photos of its unique features. 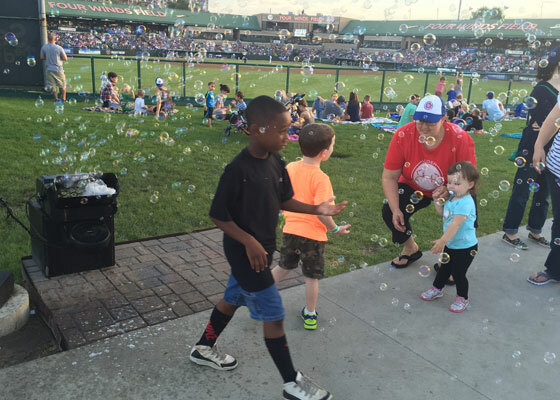 The warm summer evening attracted a large crowd for that Saturday, especially families who enjoyed the kid-friendly activities and inflatables around the ballpark. 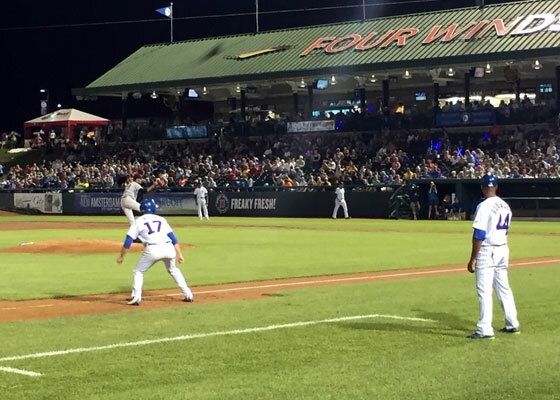 Despite the fine weather, the Cubs lost their game to the Great Lake Loons 7-2. After a long day, we left the game a little early to head back to campus. This gave me the opportunity to walk around Notre Dame one more time, stopping at the Grotto and saying prayers for my family and friends. 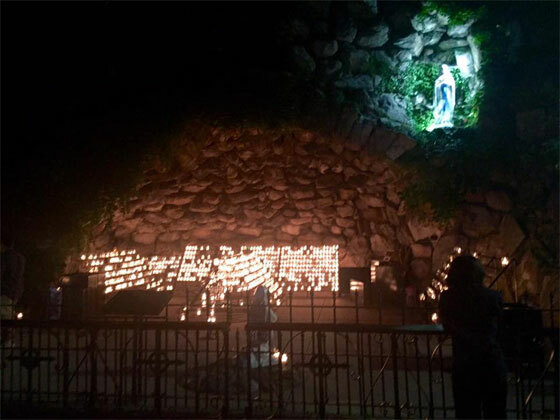 While I sat there in the darkness, lit only by candlelight, I thought of the many times I had stopped at the Grotto. Looking back, I know my life has been blessed and I am happy to share my singing talents at ballparks and at church.